The Squires Squad: Welcome to the World McKinley Jane!! Welcome to the World McKinley Jane!! One month ago, we welcomed our beautiful little girl McKinley Jane into our lives. I was lucky enough to be induced at 38 weeks due to a medical condition called the anti e antigen. Anyhow, we were supposed to go into the hospital at 7am on September 2nd. But due to a busy delivery floor, we were bumped until further notice. Finally at around 3pm, we were called to head to the hospital. They started the patocin as soon as we got there and we were in the beginning phases of getting the labor going. At around 5 pm, my mid wife Claudia broke my water. At that point I was dilated to a 2. Instantly as soon as my water broke, I started to dilate. I quickly started contractions and received an epidural at 6:10ish. An hour and five minutes later our beautiful baby was welcomed into the world weighing 6lbs6oz and measuring 18". 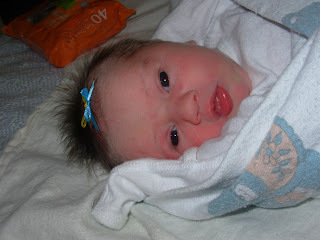 Because of this anti e antigen I had, they decided to test her billirubin levels at 6 hours after birth. Normally, they wait 12 hours. After the test, they found that her levels were really high and they immediately put her in the level 2 nursery and under the billi lights. And there she remained for four days. It was aweful. But at the same time, we were thankful that they tested her so soon. Otherwise we would have been looking at transfer to Utah Valley Hospital and a blood transfusion. What the anti e antibody did was attack her red blood cells. Which was why they induced me due to how dangerous this could have turned out. After a very rough four days we finally brought her home where we were able to hold her and love and kiss her. She is so loved by her big brother and sister. They take such great care of her and adore her. We are so blessed to have her in our lives and love her more and more everyday! She is the perfect addition to our family. In other Squires family news, our baby Andrew started kindergarten this year! He has two wonderful teachers, Mrs, Payne & Mrs. Caldwell, and gets to go to all day kindergarten. He is already learning so much and it's fun to see him grow by leaps and bounds. Yes I cried when he got on the bus. But loved the fact that I was able to be there to watch this monumental day take place. So Cute!!!! Darling little family. Glad all is going well! !